5002803 Brick Key Light (Yellow) is a Miscellaneous set released in 2013. It features a yellow 2x2 brick light. It was only available for just over a month, between September 25, 2013 and November 23, 2013. This is a description taken from LEGO.com. Please do not modify it. (visit this item's product page) Light the way to building fun in classic LEGO® style! Cast your room in mellow yellow with the super-bright, iconic yellow LEGO® Brick Light. It’s easy to mount on the wall of your closet or over your toy box so your LEGO building sets are always easy to find; just detach the utility light from the base. Makes a great gift for LEGO fans! Detach from the base and mount on your wall! Makes a great gift for LEGO® fans! 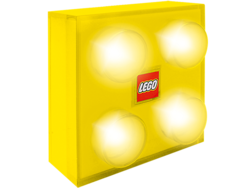 Facts about "5002803 Brick Light (Yellow)"
Light the way to building fun in classic LEGO® style! This page was last edited on 7 November 2016, at 12:03.